A Classic Parlor Favorite . Combining Mystery, Audience Participation, Comedy & Magic! Display the brilliantly colored tube, a base with a clear plastic tube installed. 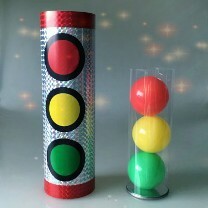 The three balls are placed in the plastic tube and covered with the tube. The balls change order back and forth, when covered! ball on top jumps to the bottom and so on. Vanish this jumping ball and it still appears in the middle of the other balls in the tube!